Belonging to UNESCO Heritage List, Ngare Ndare Forest is a hidden gem of Northern Kenya. Visited mainly by locals and residents who know about its existence, the Forest is known for its azure waterfall and rock pools, walking above the trees' canopy and the presence of many elephants. The lush greenery spreads between the high twisted trees covered in moss. The sun makes its way through the hanging branches (100% sure that Tarzan lives somewhere here and swings on the vines! ), and hundreds of butterflies flutter around as you walk past. Ngare Ndare Forest lays on the border of two of Northern Kenya's counties - Laikipia and Meru, and on the border of two conservancies - Lewa and Borana. Its location provides a chance to explore the nearby areas without much effort. Watch our short film here and make sure to scroll down for more! The walk from the campsite to the waterfall is an easy one hour trek through the beautiful forest. You pass through some seriously amazing paths where orange dust makes its way amongst the old gnarly trees. Their canopies create a natural umbrella that gently covers the sky, which gives you some pleasant shade. Once you get down a pretty steep set of handmade wooden steps on the last bit of your walk, you reach the waterfall. There you find yourself looking at about a 15 meter high cliff with the water flowing down to a pale blue rock pool. All of this surrounded by large trees hugging the pool. You're welcome to jump in and enjoy a refreshing bath but be ware that you may have experience ‘body freeze’ (like ‘brain freeze’ but just to your whole body) straight away! The water is sooooo cold as it source from a mountain spring near Mt Kenya. If you're lucky, you may spot some elephants around. We saw one not too far from the waterfall, and we were wondering how it got all the way down from the top of the hill. Jeremy, our guide, said that when humans are not there, elephants slide down on their bottoms from the steep sides of the hill to the cool water - what a funny sight that would be! 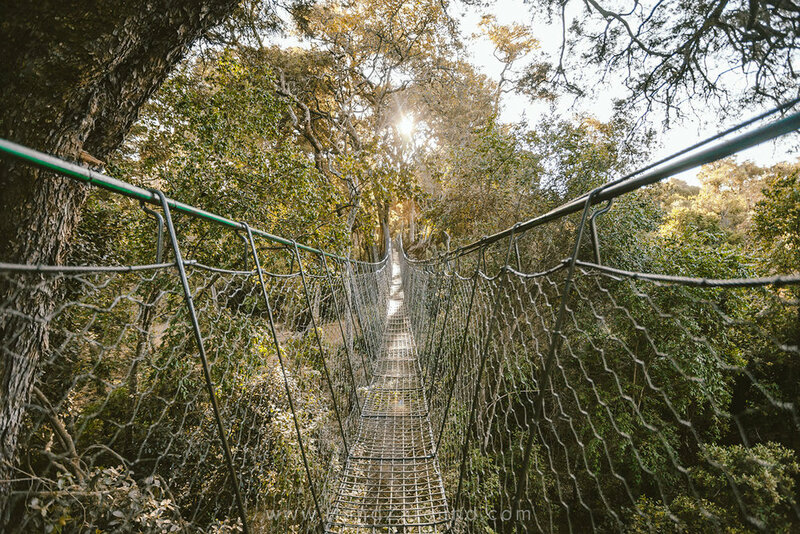 Rising 10 metres above the ground is Ngare Ndare's canopy walk. 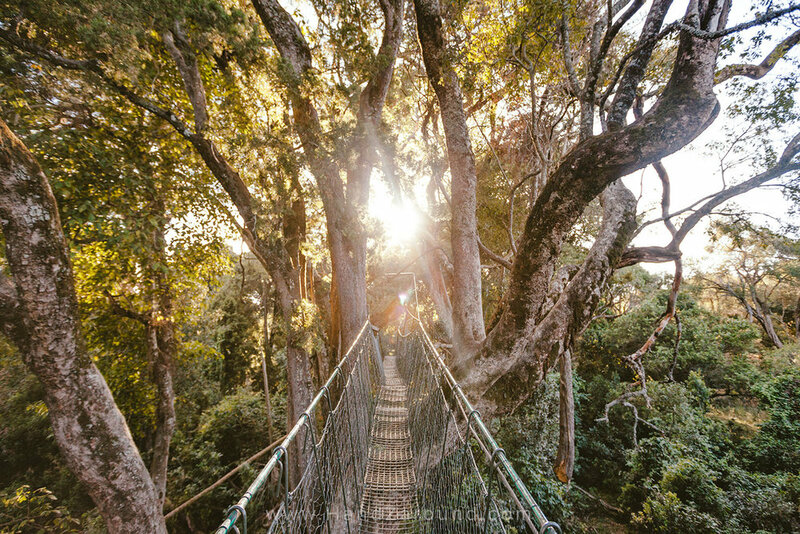 It's a hanging walkway that takes you 450 metres into the forest, above and through the canopies of the highest trees. It's good to do it shortly before sunset when the light goes through the branches and leaves, creating one of the most wonderful spectacles nature can come up (it was seriously one of the best things we've done during our 1.5 year long travels!). We felt like we were in a beautiful Hollywood movie but there was no crew around - we had the whole space to ourselves - stunning! Again - if you're in the right place at the right time you may spot some animals. We had a pleasure of seeing an enormous elephant grazing it's way through the trees under our feet, a few other elephants in another part of the forest and a little deer drinking water from the pond near the platform at the end of the canopy. Oh, and we spotted a bunch of big monkeys looking at us with interest when we stood at the wooden platform at the end of the canopy walk. All around there are hundreds of colourful birds and butterflies, so you will be sure to be entertained by them! We also spotted quite a few elephants, monkeys and deers. This was all only in Ngare Ndare Forest. 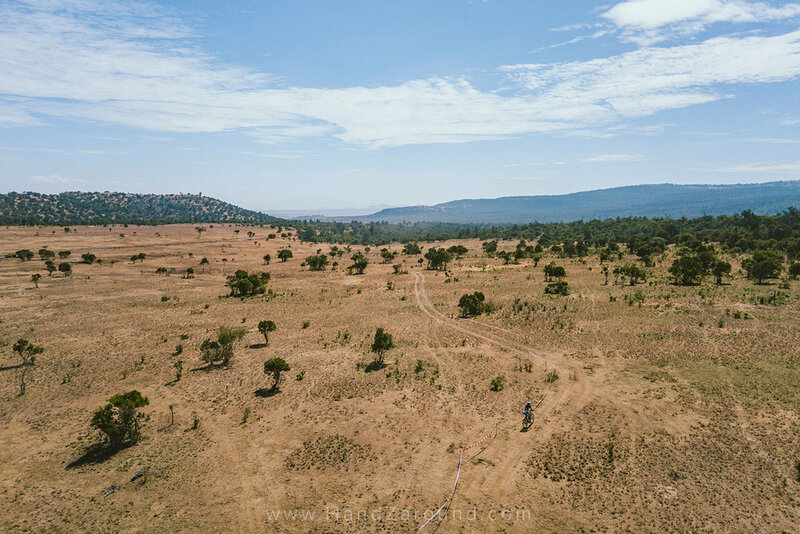 If you head to nearby Lewa or Borana conservancies, you will be sure to spot many more animals, such as zebras, giraffes, warthogs, and if you look for them long enough, maybe even rhinos! Once a year, Ngare Ndare Forest hosts the 10 to 4 Race. The bicycle race is great for pros, but also for amateurs or even the whole family! There is a variety of different paths and lengths for different levels of expertise. Since all our travels are budget-oriented, we were looking for a relatively cheap way to get to Ngare Ndare Forest, which is located about 4,5 hours North from Nairobi - about 235km. We hesitated whether to rent a two-wheel-drive or a 4x4 car and eventually we rented 'a normal city car' - Toyota Axio - for 3,500 KSH (35 USD) a day in Nairobi. We found it through simply googling 'rent a cheap car in Nairobi' and calling multiple ads and companies, until finally one of them had a deal suitable for our budget. We organised it actually in one day, and it was just a day before we left, so you'll be alright to organise it quickly, if you make enough calls to everyone in Nairobi that pops up on google! In the rainy season, you may need a 4x4 car. You also may need a 4x4 car, if you don't want to be stressed when you decide to pass through conservancies (like we did!). The roads are not too good, and we did pass through them with our small Toyota, but we had a couple of heart attacks when the bottom of the car rubbed against the rocky dirty roads. The other option is public transport (fun!). Initially we wanted to do this: getting a matatu (a minibus) from Nairobi to Nanyuki (we learnt it's about 400-500 KSH (4-5 USD) per person), and once in Nanyuki, getting a local taxi to Ngare Ndare Forest (about 30 USD to take you there and pick you back up in one or two days). The best way to have everything within the reach of your hand is stay in their campsite. The campsite is easily accessible from when you drive in/get dropped off by a car. If you arrived with your car, you can drive through a little low stream (we didn’t have 4x4 and we didn’t have any problems doing that) and once you’re on another side, you can park next to where your tent and the fireplace will be set up. If you get dropped off by a taxi, you will walk less than 5mins, across a wooden path through the stream, and you will find yourself right where the campsite is. When you stay in the camp, you will also be right next to the canopy walk and a stream. The campsite has basic facilities of a drop down toilet and a fresh spring water shower. You’re provided with the wood for the fireplace, which means you can do some cooking over the fire. In the night you will be guarded by an armed ranger, who will make sure no wild animals are interrupting your sleep. 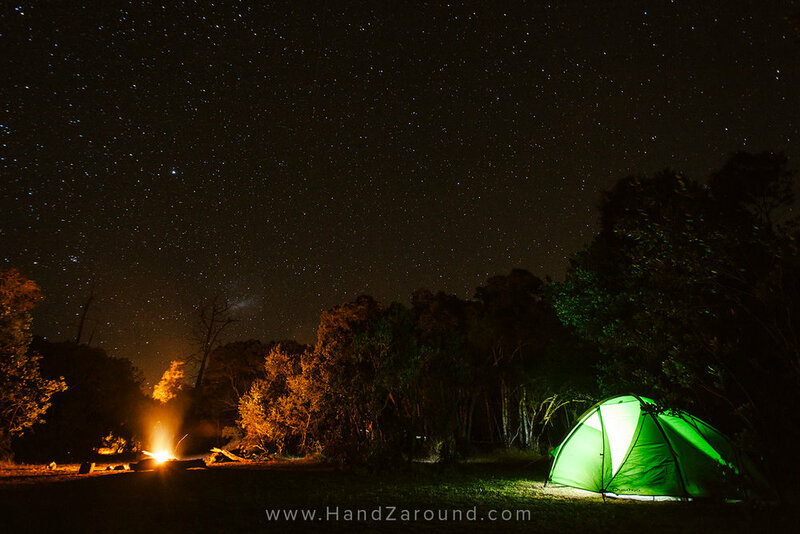 The campsite is often visited by herds of elephants so you may hear very interesting noises in the night that will definitely add up to your Ngare Ndare camping adventure! Make sure you pack up warm clothes because in the night it gets really cold. During the day out in the sun it can get quite hot, but if you want to escape the heat, just head to the shade for a bit. If you’re not a fan of camping, you can still stay nearby in affordable Sieku Glamping (glamorous camping). You can see our post about this beautiful site with all the essential information here. Children above 10 years pay ½ the price of adults. For Nature walks/Hiking to the pools, you will need an armed ranger whom you pay KSH 1000 for the whole group. You will also pay KSH 1000 to the armed ranger if you are camping per night. Thank you to Ngare Ndare Forest Trust, Northern Rangelands Trust and The Big North for hosting us. Follow Ngare Ndare Forest Trust on Facebook for the latest updates. To book your stay or activity in Ngare Ndare, email bookings@ngarendare.org. Follow NRT on Instagram and Facebook. Follow The Big North on Instagram and Facebook.